Spectacle has announced that work has begun on its new film about Battersea Power Station, commissioned by the World Monuments Fund and American Express. The film is due for release in Autumn 2015. 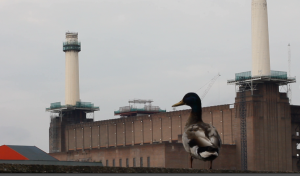 The film will look at the historical and architectural significance of the power station, as well as the tireless efforts of the Battersea Power Station Community Group (BPSCG) which have led a grassroots campaign to preserve the building for the public good since the early 80s. The film will follow this debate in an even-handed, factual and interesting way, becoming a case study for similar issues in other cities around the world where a historic building finds itself on a high value site. From gracing the covers of a Pink Floyd album to generating a fifth of London’s energy at its height, Battersea Power Station is a creation steeped in industrial history and rich in meaning. With stunning imagery throughout the ages – some from Spectacle’s archive and others newly shot – the film will reveal, in a unique manner, some of that history and meaning. It will raise awareness to the needs for preservation and the current challenges faced by conservation. Spectacle is an award-winning independent television production company specialising in documentary, community-based investigative journalism and participatory media. Spectacle has been documenting the changing landscape around Battersea Power Station for the past 15+ years. Spectacle’s film work has been exhibited at galleries worldwide, including Tate Britain, Tate Modern, Tate Liverpool. The Photographers Gallery, Institute of Contemporary Art, National Film Theatre in London. Glasgow Centre for Contemporary Art, National Architecture Institute Netherlands, Kunstverein Hamburg, Pianofabriek and “Bozar” Brussels. It’s broadcast films include “Battle of Trafalgar”, (Winner of Prix du Public Nyon Film Documentaire), “The Truth Lies in Rostock” (Nyon Documentary Award Special Mention). The Guantanamo films- “Outside The Law” & “Shaker Aamer: a decade of injustice”. This entry was posted in Battersea Power Station and tagged architecture, art deco, battersea, Battersea Power Station, Battersea Power Station Community Group, Battersea Power Station Development Company, Battersea Society, BPS, community, English Heritage Survey of London, English Herritage, Historic England, independent film, industrial heritage, Nine Elms Battersea opportunity area, Vauxhall Nine Elms Battersea Opportunity Area, wand, Wandsworth borough, wandsworth borough council, wandsworth council by clockword. Bookmark the permalink.